"This review was made possible by iConnect and UpSpring. I was provided compensation to facilitate this post, but all opinions stated are 100% mine." 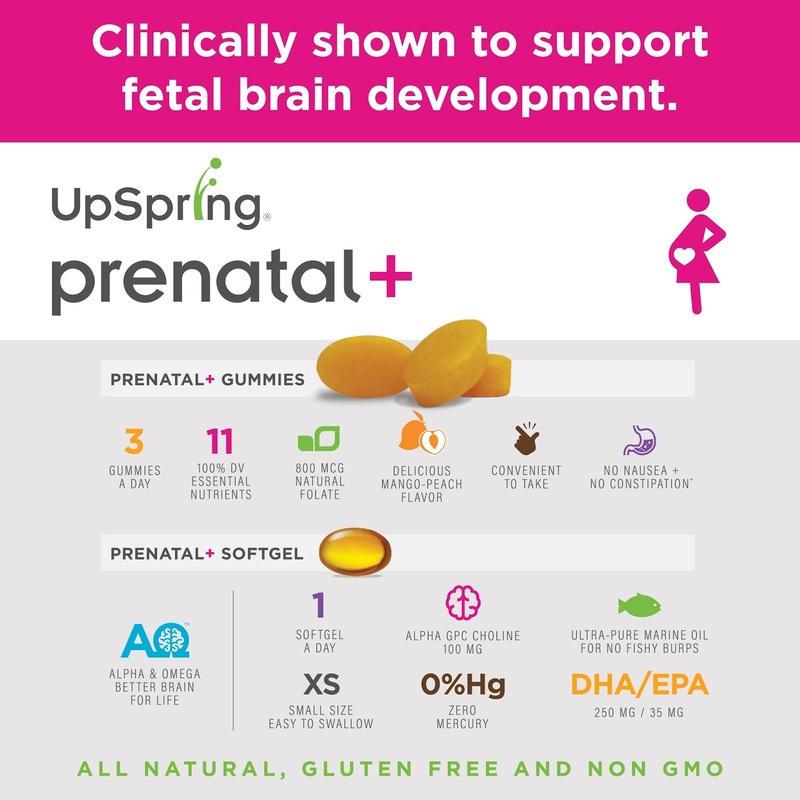 If you are like me and prefer a gummy prenatal during pregnancy, I highly recommend giving UpSring a try. 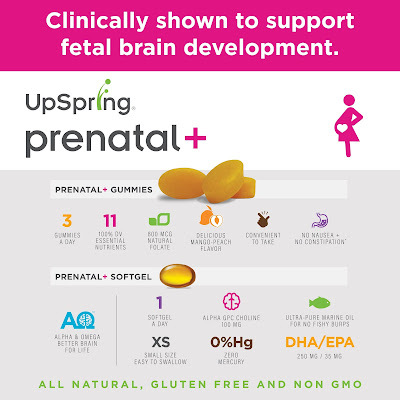 UpSpring Prenatal+ is a complete multivitamin that also includes omega-3 DHA and choline (in the form of Alpha GPC), which are clinically shown to support fetal brain development. Alpha GPC is a highly bioavailable form of choline and the only form that crosses the blood-brain barrier to nourish your baby's growing brain. It also helps to enhance DHA absorption. This formula also contains the natural form of vitamin B9, folate, instead of synthetic folic acid. Enjoy three delicious mango-peach gummies every day plus one easy-to-swallow softgel. You get 100% of the daily value of 11 essential nutrients, plus brain-building omega-3 and Alpha GPC. Best of all, their gummy is easy on the stomach, so no tummy upsets! 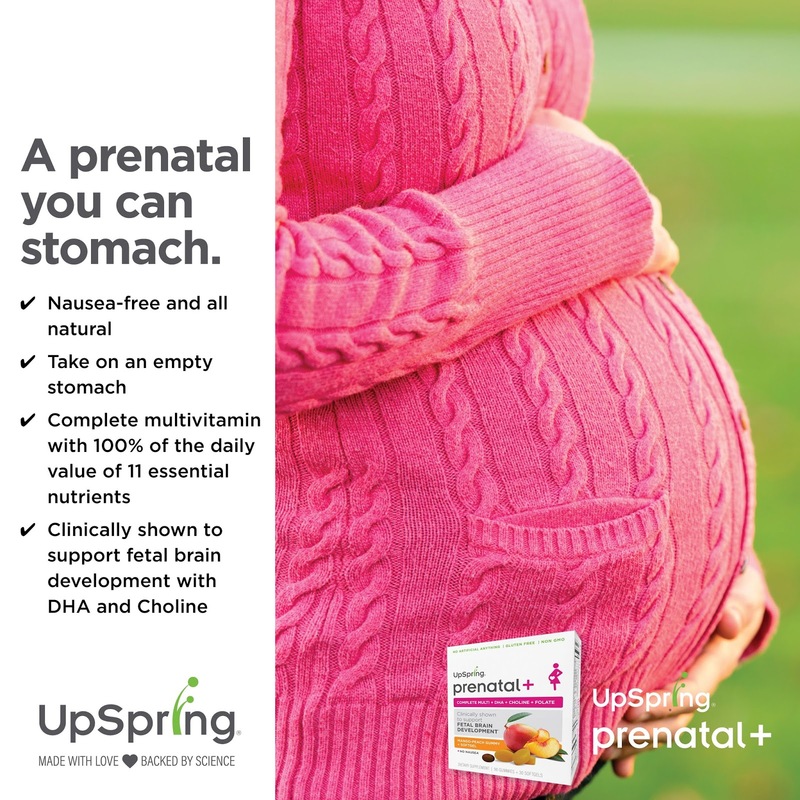 What I love about UpSring, besides the no tummy upsets, is that UpSpring, is a mom-founded and mom-run company and has a mission to empower parents with confidence and to give them the freedom to enjoy motherhood even more! How? By finding innovative solutions to the everyday health and wellness challenges and frustrations facing mothers of a baby or young child, UpSpring provides "more fun, less worry." Since 2005, UpSpring has made all-natural products based on true science that solve real problems. Plus, their products are affordable and can be found at your local Target! (In the Women's Health & Family Planning aisle). I am beyond happy that I found a prenatal like UpSring that doesn't make me feel nauseous, especially considering I'm 33 weeks! I get to finish my pregnancy taking my daily 3 delicious Mango Peach Gummies and 1 Liquid Softgel! Prenatal+ is also available in an easy to swallow tablet with 18 mg of iron. Be sure to visit your local Target or UpSpringBaby.com to learn more! Nice to see a product that doesn't affect the stomach. I had such morning sickness when I was pregnant and taking anything was a chore. Thanks for sharing the product. I'm not pregnant and don't plan to become pregnant, but I still like to take a prenatal vitamin. They are great for your hair/nails and typically don't upset my stomach like some vitamins can. I wish there were prenatal gummies when my wife was pregnant with our daughter! She dealt daily with morning sickness, for what seemed to be during her whole pregnancy. I would recommend these for any lady who is expecting, or, if they want a supplement for their hair and nails. What a wonderful prenatal vitamin. If there's ever a time when nutrition was important .. it's this. I remember when I was pregnant and started taking one .. my hair was also super shiny and my nails grew like crazy. Passing your post along to my daughter. She's about 20 weeks along and I know she'll appreciate them. I have been reading a lot about this brand of prenatal vitamins. Sounds like a great brand. I need to get back to taking a daily vitamin. Even if I am not expectign I think the prenatal are great options! 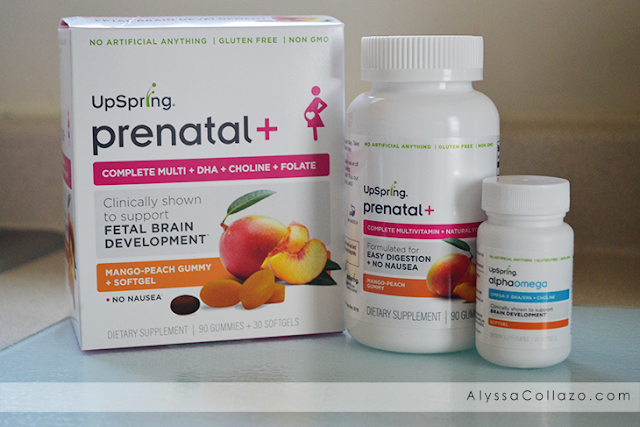 I actually prefer to use prenatal vitamins even thought I'm long past having another child. They have so many of the vitamins and nutrients we need as women. I have grown to like gummy vitamins over the traditional pill form over the past two years. These would have been a God send when I was pregnant. I used to gag on my prenatal vitamins, so I just didn't take them at all. I know that that isn't a great option, but that was my only solution.